I did get my banners done though. And I'm almost done with the binding on that customer's quilt. And, I'm going to work on the store quilt when I get back from my trip...And, I did clean my shower, my bathtub, my laundry room, my pantry, and folded lots of laundry over the last few days. justification. Do you hear what I'm saying??? Boy! Do I know what you are talking about!!! I love your colourful block... now you have inspired me (see how easily it happens?) Thanks for sharing. hear, hear! i do the same thing with craft projects. see so much goodness and you want to keep diving in over and over again! You are more than JUSTIFIED! Quilt away. You are so right...there is nothing like starting a new project! Love your stars. I'll have to try that! I SO hear ya! I love starting new quilts! Even if I have 100 other UFO's! I am loving your blocks, can't wait to see more! Those stars are stunning...I can see why you were attracted to sew them up! I so hear you!!! I actually have a little pile of material for a quilt that I am letting myself play with as soon as I get my projects done! It tempts me though and teases me and I take time out to pet it and think about what to make! I really like the scrappy stars! I hear ya too!!! It is beautiful. Yes, I hear what you're saying! I layed in bed last night thinking that if I didn't sew today I might have an anxiety attack. So I worked on a Christmas table runner, quick and easy. 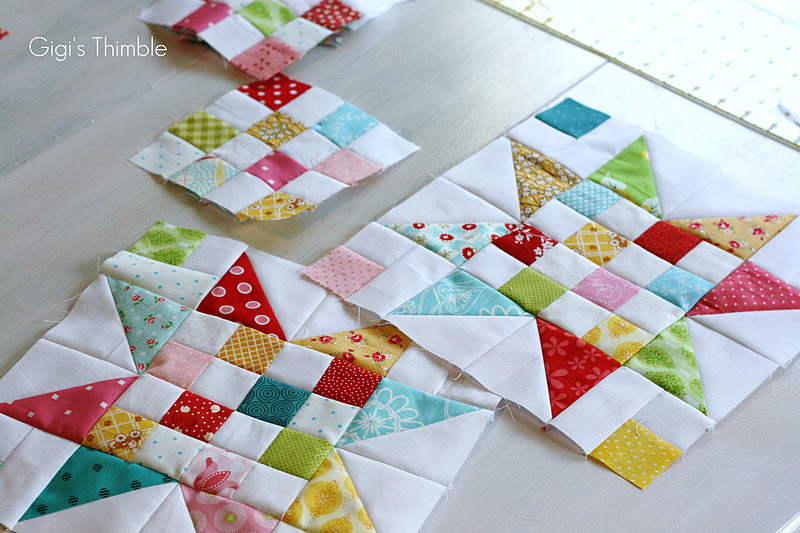 I am in love with those star blocks and really wanted to destash my scrap basket but didn't want to make string quilts. This is fabulous! Your color choices are so, so pretty! I love scrappy blocks like that!!! Is this a 12.5 unfinished block? Your stars are too cute for words! No justification needed - we all understand. Hoping you're starting another project soon if you're so inclined! I hear ya Amber! LOVE those cute little blocks!!! I'm having trouble leaving a comment, so sorry if this is a duplicate of sorts, just wanted to say that it's really cute & i love the little patchwork in the middle. So fun using up those scraps too. You're always so good at that. Hi Amber, I was following the 'Holiday Gift Tutorials & your table runner is very nice. Could you give me the size of the holly leaf (width X length)? I cannot download the template in the format offered in tutorial. I found your blog from the Pinterest pin of the above photo. Love the block, love the blog. I'm Block of the Month chairman for my guild, and I have this block (minus the cornerstones) scheduled for one of our projects. Isn't it fun? Love it! Oh how I wish I could sew that evenly! Love your colors for the block! Glad I popped in to check you out! I'm with you on starting new quilts, can't resist with all the wonderful fabrics & patterns. Love your star blocks. You could have raided my scrap bin to make those. Love me some Quilt Soup fabrics! Thanks for sharing & happy stitching. Can I be random for a minute? Holiday Gift Tutorial from me to you!